Fig. 1. Schematic diagram of the mammalian autophagy core machinery and CRISPR/Cas9 targeted genes. 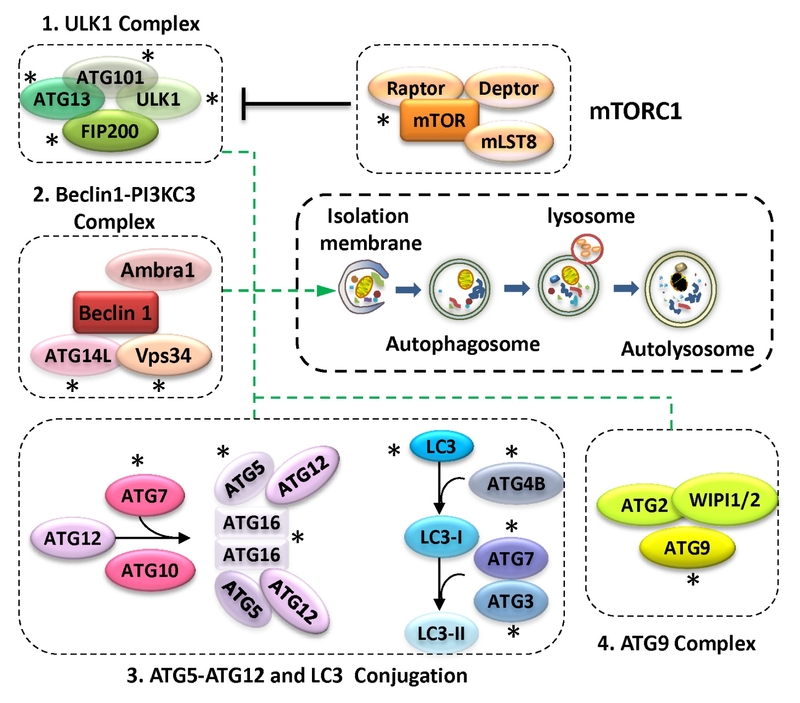 The Atg proteins form several important functional groups in control of autophagosome formation. (i) The ULK1 complex, consisting of the serine/threonine kinase ULK1, ATG13, focal adhesion kinase family interacting protein of 200 kDa (FIP200) and ATG101, controls the induction or initiation of autophagy for the formation of phagophore and is negatively regulated by mechanistic target of rapamycin (mTOR). (ii) The Beclin 1-class III PI3K complex controls the nucleation step of autophagosome formation. (iii) The two ubiquitin-like conjugation systems (the ATG12-ATG5 system and the LC3 system) mediate the elongation stage, leading to formation of a complete autophagosome. And (iv) The ATG9 retrieval process functionally involves a protein complex of WIPI1/2 and ATG2. The CRISPR targeted genes () in the autophagy core machinery in this review was indicated by an asterisk (*).